We Drink Beer. Everyday: January 22: Trevor and the quest for the English crown, a short story. January 22: Trevor and the quest for the English crown, a short story. 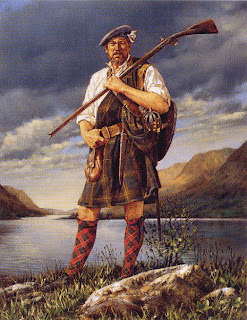 Jacobite simply means "follower of James" as in II of England, the last of the Stuart monarchs. In a series of uprisings between 1688 and 1746, a bunch of pissed off clansmen kept trying to restore the house of Stuart to the throne. The most famous uprising is the last, and is the one this beer is actually commemorating. In 1745 "Bonnie Prince Charlie", or Charles Edward Stuart, emboldened by support from his cousin Louis XV of France, went to the Scottish Highlands all by his merry self and rallied the Jacobite clans to his cause. The army marched South to invade England with absolutely nothing under their kilts and tartans. Here, we have an amusing anecdote. The Jacobites employed a shock tactic in battle known as the Highland Charge. It basically involves a bunch of bloodthirstly Scotsmen removing their kilts and runnig full tilt at their enemy, screaming at the tops of their lungs. The opposing force, stunned by the pale thighs and menacing, er...you get the picture, would'nt fire as quickly as usual, and ended up getting overwhelmed and tea bagged in short order. No matter how many times I think of this, it's always funny. Try it sometime. Anyway, the Jacobites and their "Bonnie Prnce" were soundly defeated in 1746 at the Battle of Culloden, ending the threat of London being invaded by fierce, bearded men without pants. Feel smarter? Me too. I poured this into a pint glass, so as not to be haunted by pantsless clansmen, and because it is, in fact, a Scotch Ale, and ought to be consumed from such a vessel. It pours a luminous, ruby-brown, gorgeous, actually, with a thin, tan head that vanishes almost immediately. The nose is all dark fruit and booze, more like a Belgian Quad than a Scotch ale. The coriander, which brewers (including myself) typically overdo, leaves only a pleasant hint, which I appreciate. The taste is plums, raisins, and figs up front, slathered in toffee and vanilla (contributed by the barrel, no doubt). There is an immediate boozy warmth that doesn't leave, and the finish is slightly smoky and sweet on the lips. The mouthfeel is where this beer goes wrong. It's thin, has very little carbonation, and can't stand up to the alcohol, which (though only 8%), begins to overwhelm everything about halfway through the pint. All things considered, I find this to be an excellent example of what barrel aging can add to a beer. Without the barrel, this would be a decent Wee Heavy, but would lack the complexity to deserve a recommendation. The extra time spent picking up the toffee and vanilla notes from the wood serve to balance the taste, and deliver a much more enjoyable experience.